bring your model to a much higher standard than anything ever offered! No other structure says "RAILROAD" like the roundhouse. The Northern Pacific Railway's engineering department created this standard plan 90 ft. brick roundhouse in 1910 to serve its growing fleet of steam locomotives. C. C. Crow has re-created this same structure for you in museum quality HO scale. The fine scale brick walls feature my hand-scribed brickwork cast in White Hydrocal with artistic detail no machine can match! Add the optional pits and floors and you'll have yourself an even greater model. You can add as many additional stalls as you like to the basic three stall kit. The kit features prototypical windowed engine doors made specifically for this project by Central Valley Model Works. Custom triple-hung windows by Grandt Line Products were also done for this model. The roofs are constructed board-by-board over full-size templates with laser-cut Northeastern Basswood. Complete step-by-step instructions are included with painting and mortaring techniques fully explained for outstanding results. A very limited run of "Deluxe" versions have been manufactured with the brick detail inside and out by carefully milling and mating two cast walls together in a scale width sandwich. We are working on a 48' x 96' brick Back Shop addition for light engine repair and maintenance which can stand alone as a Car Shop or Engine House. Listed below are current prices for the Standard Plan 90 ft. Brick Round House kit. These are the highest quality White Hydrocal castings rendered to scale with fine exterior detail. They come with simplified trusses, board-by-board roof, windowed engine doors, triple-hung windows and smokejacks. Your model can be placed in a shorter distance if a wider back wall is specified, see below. One of the original side wall molds finally gave out so I have renewed the entire set, but note that the new rubber I am using shrinks less. On most models the difference is negligable however because of the length of the roundhouse it becomes signifigant. Nothing to worry about if you are buying a new kit BUT if you are fitting additional stalls or adding the pits and floors to an older model take note. Let me know and I will advise if it's something we should consider. You want the best for your railroad, right? Upgrade your roundhouse with an optional model kit of the interior brick floor, concrete inspection pits and stone foundations is offered separately. All the masonry details are cast to exact shape and scale, even to front sewers are there. Installation requires special considerations, as 1-5/8" is required below railhead height, including recommended 3/4" plywood base. Not adaptible to wider versions however. NP Round House Data Sheets and Standard Plan drawings are being prepared for the Northern Pacific Railway Historical Association quarterly publication, The Mainstreeter. Additionally, a modeling article will be submitted for publication featuring the six stall pilot model built for Jack Parker's fantastic NP layout. Data sheets include 24 site diagrams for NP mainline facilities. The standard (prototype) design is based on a sixty-stall circle with six degrees per stall requiring 133'-9" from turntable (TT) center to engine door, plus 90'-0" of structure or about 31 actual inches total in HO. Each stall is 23'-9" wide at the far end. Engine doors are 13'-0" wide, plus 12" posts, for 14'-0" centers at the doors in all cases. If using with a 90 ft. turntable the rails will come together at the pit, as like a turnout frog. Electrically, this might scare you but it's no big deal. Toggles could be used but note a short would result if two side by side were accidentally thrown. A double pole rotary switch or a two pole wiper mounted under the turntable will provide power to the two rails (it doesn't matter that the adjacent stall rails in common via the frog are powered since it is only on one side so no circuit is completed). If DCC one of those automatic reversing units will do the job. Mechanically, yes, it will be a chore but no more difficult than hand-laid turnouts. Of course the simple answer is to use a larger turntable. 6° 60 223'- 9" 133'- 9" 23'- 6"
8° 45 190'- 3" 100'- 3" 26'- 6"
10° 36 170'- 0" 80'- 0" 29'- 8"
12° 30 156'- 9" 66'- 9" 32'- 9"
15° 24 143'- 6" 53'- 6" 37'- 6"
Standard Plan kit is based on sixty stall circle. In all cases door (plus post) width is 14 ft. I really don't recommend this but I know some of you are short on space. Two wider rear wall options allow construction in shorter spaces however the cast Pits and Floors are not adaptable as they are cast to the specific angles. Materials and instructions are given for modifying the clerestory and expanding the roof (which is not laser-cut for these options). Sorry, no retro-fits as this involves a completely different lumber count/cut. Please add $10.00 per stall for either option. I'm very pleased that my pilot model has been installed on Jack Parker's Northern Pacific layout. A little gray ink wash and some colorants. It's not that difficult. Whole 4" x 8" panels of the stuff. Use them for retaining walls, foundations, even make complete buildings like I have. 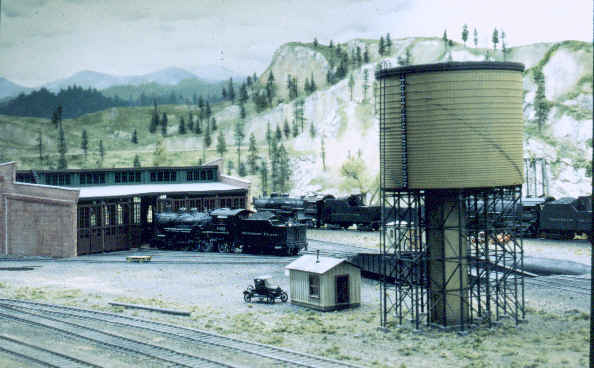 A Northern Pacific Standard Plan Interlocking Tower.